We all have a favorite way of giving back to our community. From donating hard-earned funds to volunteering time to help others in need, there are endless ways to lift others’ hearts during the season of giving—and Marylanders exhibit this generosity better than almost anyone in the nation. 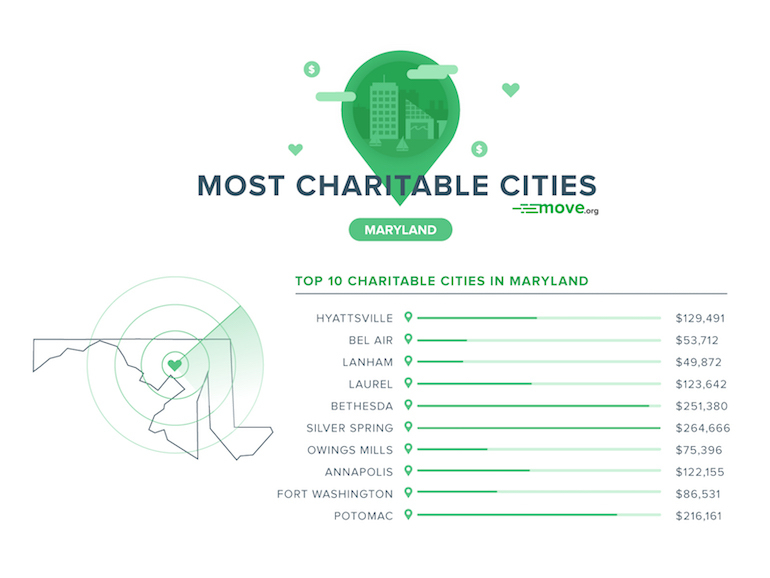 Maryland ranks as the second most charitable state in the US,1 but we wanted to dig a bit deeper to learn which of its cities were the most charitable of all. Read on to learn who we ranked as Maryland’s top ten most charitable cities below. Curious about how we calculated our rankings? You can read a full description in our methodology section. Hyattsville tops our list as Maryland’s most charitable city. Thanks to an incredibly high average contribution of $7.06 per person, Hyattsville’s giving shines in the Old Line State. Since we limited our rankings to cities with 10,000 residents or more, Bel Air was the smallest town to make the cut. But despite its small size, its residents have big hearts. Bel Air boasts the second-highest average contribution per person at $5.35. It also has one of the highest concentrations of charities per capita, making it a great place to live if you want to engage in a good cause. Like Bel Air, Lanham has a rather small population, ranking eighty-third out of the eighty-four cities we researched. This small town has a lot to be proud of, however. Lanham’s average charitable contribution is $4.91 per person—the third highest on our list. As a result, its total charitable donations land within the top 30% of the entire state. Laurel may have started out as a humble mill town, and it hasn’t left that productive heritage behind as it continues to churn out charitable donations year after year. Laurel’s citizens donated $123,643 in 2016—the eighth-highest total for charitable donations in the state. So how did it reach number four on our list? Its average contribution of $4.77 per person was the fifth highest of all the cities we surveyed, and it has a rather high charity per capita ratio to boot. Bethesda isn’t just a great place for a day of shopping—it’s also a great place to give back. Bethesda takes third place in two of our major categories: number of charities and amount of charitable donations. However, it’s also the largest city on our list so far—bringing its average contribution per person down to $3.97 (which is still rather impressive). Silver Spring takes the cake for the most charitable donations among our top ten. In fact, within the whole state of Maryland, Silver Spring’s total of $264,666 comes second only to Baltimore’s total of $422,464. So why didn’t Baltimore make the list? Put simply, population. Even though Baltimore’s total donations nearly doubled Silver Spring’s, its population also dwarfs Silver Spring’s by over 400,000 people—reducing Baltimore’s average contribution to just $0.68 per person. Silver Spring’s contribution, on the other hand, is five times greater at $3.45 per person. Home of the Baltimore Raven’s team headquarters, Owings Mills also houses a team of incredibly charitable citizens. Despite its small population being in the bottom half of the cities we researched, it still managed to reach $75,396 in charitable donations. Between the high number of charitable contributions and the 317 charities in the relatively small city, Owings Mills easily makes its way into our top ten. Maryland’s state capital handily secures the eighth spot on our list. Annapolis’s residents contribute the tenth most in the state at an average of $3.11 per person, and its 764 charities give them plenty of options to put that money toward a good cause. Fort Washington, named after the historic fort bearing the same name, is a beacon of charitable strength within the state. Although it may have a lower ratio of charities per capita than the other cities in our top ten, Fort Washington’s average contribution of $3.65 per person beats both Annapolis and Silver Spring. Despite CNNMoney listing Potomac as the most affluent town in the country,2 it’s only the tenth most charitable town in Maryland. This isn’t due to its residents’ contributions, however. At $4.85 per person, its average donations are the fourth highest in the state! The only reason it didn’t earn a higher spot is found in its number of charities. Although Potomac ranks fifteenth for its total number of charities (an impressive 409), it lands down at the twenty-third spot for number of charities per person. How generous is your city? Inspired by Maryland’s most charitable cities? Let us know how your city stacks up in the comments below! Also, check out our Find-a-Mover tool if a move to one of these cities is calling your name.